Saremi is born in Hamburg, raised in Los Angeles, and studied writing at the University of Southern California. Besides being the editor of Pars Arts since 2006, she works as a content development manager at a new media studio and a freelance journalist who has been writing about books, food and technology. 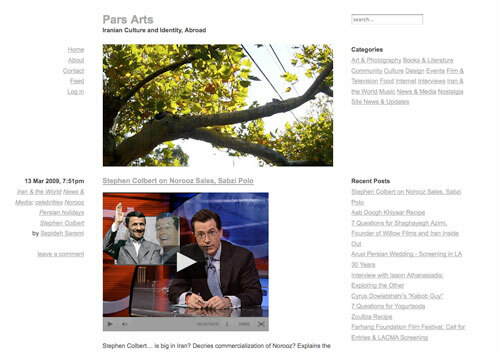 Pars Arts is an English-language blog focusing on Iranian diaspora culture. As a continuation of last week’s episode about Iranians’ Blogs, this episode takes time to clearly focus on the concept of diaspora and its artistic and cultural productions. First of all, I would like to start by mentioning the subtitle of Pars Arts: “Iranian Culture and Identity, Abroad”. As you also mention on your personal website Pars Arts clearly focuses on the Iranian diaspora culture. I believe the concept of diaspora is something very complex. What would be your subjective interpretation of this term? To me, “diaspora” are people who have their cultural roots somewhere other than the place in which they are now settled. I think this applies not just to immigrants, but often to their children or their children’s children - people who may never have set foot in the place they say they come from (which applies to me). For me, it has a lot to do with perceiving yourself as culturally and geographically displaced, a kind of feeling of being unsettled or a little but unmoored. If you have to think about your culture or explain it to other people, you’re probably part of a diaspora. In your opinion, why is the definition of diaspora usually considered to be something which generates endless arguing and quarrels? In your opinion, is it possible to talk about a diasporic genre in art and/or culture? What would be the specificities of such a genre other than the geographical borders? Yes, I think it’s definitely possible to talk about a specific genre - I think it’s pretty interesting to try to define it’s specifications, actually. Has someone done this already? I am no art historian or curator but some of the things I’ve been seeing in Iranian diaspora expressions are similar in tone and mood - there’s a lot of longing, displacement, nostalgia, sadness, and, within the last few years, often a lot of humor, too. What is your actual relationship with Iran? I have never been to Iran, nor have I met most of my relatives that live in Iran. I was born to Iranian immigrant parents in Germany, in the early 1980s, when it was not a very immigrant-friendly place, and raised in Los Angeles during the 1990s. L.A. is home to one of the largest populations of Iranians outside of Iran, so I was lucky to be surrounded by a lot of Persian culture and language when I was growing up, but I really took it for granted until I was much older. To say I have a relationship with Iran would be a stretch, but there’s definitely a very emotional connection I feel with Iranian-ness, whatever that is - sometimes those emotions are really positive, and sometimes they are not. Sometimes my interactions with Iranians in Iran, or Iranians who are very recent immigrants from Iran, make me think that members of various diasporas can have more in common with each other than they do with people who are in or from their country of origin. Are there any particular links the Internet allowed you to create with Iran? I think the Internet has been really helpful to me because it’s allowed me to educate myself about Iran by reading blogs, looking at people’s travel pictures, and finding out about films and art that deal with Iran. And it’s really the place where I pieced together my knowledge of Iranian history and all the complicated geopolitics. This has all helped me create a more informed image of Iran and also see what Iranians outside of Iran are creating, and that many of them are thinking about and struggling with identity and belonging in ways that resonate with me. Through Pars Arts, I’ve been lucky to build a very small network of peers that live there or go to Iran often, but most of my links are with other Iranians who live abroad, most of them in America. I feel very uncomfortable with identifying myself just as an Iranian because I feel like it would be phony of me. Precisely speaking, how are the “new” means of information and communication (blogs, social networks, etc.) influencing the diaspora of today? I think new forms of web-based communication help forge community and communication with the country of origin, and that can be a very powerful thing. I think it can help diaspora feel a little less displaced, and also connect them with each other. And as I’ve said, I think reading and seeing real accounts of people’s travels can also help in providing a more nuanced image of the place your family comes from. Posted by Tolga Taluy	on Sunday, March 15, 2009 at 18:15.